Please check out the new paper just published in Marine Geology from our long time GRG collaborator Dr. Ángel Puga-Bernabéu at the University of Granada in Spain. Map showing offshore study area (after Puga-Bernabéu, Á, et al. 2016). Puga-Bernabéu, Á., Webster, J. M., Braga, J. C., Clague, D. A., Dutton, A., Eggins, S., Fallon, S., Jacobsen, G., Paduan, J. B., and Potts, D. C., 2016, Morphology and evolution of drowned carbonate terraces during the last two interglacial cycles, off Hilo, NE Hawaii: Marine Geology, v. 371, p. 57-81. 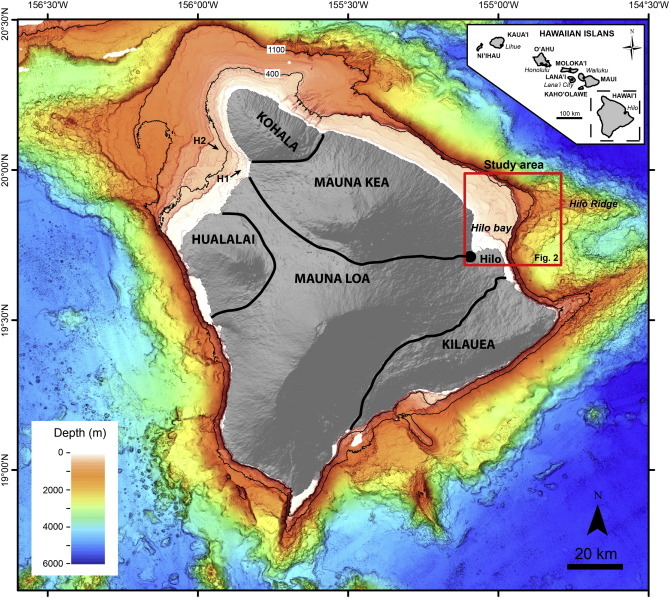 This is a really interesting and data-rich paper detailing the first discovery of drowned fossil coral reefs off Hilo, on the east side of the Big Island of Hawaii. This papers takes a very multidisciplinary approach using multibeam bathymetry, submersible dive observations and samples, sedimentological and geochronological data (include sophisticated Laser Ablation ICP-MS to measure U-series ages) to tell the story of the evolution of this margin over the last few hundred thousand year. It is a complicated story that highlights the importance of the interactions between reef development and sealevel changes but also the strong influence of volcanic activity. This was work that was started several years ago while Angel was a postdoc with us at USYD. Bravo Angel – the paper was worth the wait!